Nestled in the wooded hills, deep in the Southern Pyrenees Mountains I recently came upon a gem of a church, Notre Dame De Celles. What makes this small church so special is an apparition of Mother Mary appearing late in the 16th century. She came to a young man asking him to lead his community to a higher spiritual path. In the process she blessed the spring he was farming around that day. It quickly became apparent the spring had special healing powers and a church was built on the mountain hillside beside the spring. I found this to be true as I have made several visits and I have witnessed how the water has changed me. Still, it is not the only gift of Norte Dame De Celles as the vibration inside the church is filled with the spirit of Mother Mary, the strongest presence I have experienced of our divine mother. 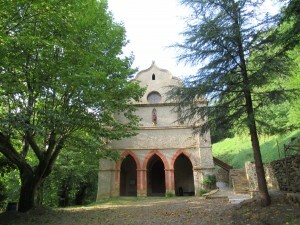 There quiet in the woods between Lalavenet and Foix in the mountain forest outside the town of Celles is the wonderful diamond, Notre Dame De Celles. The church is open to the public only on Sundays from 2 to 5 PM as a group of locals gather with Jean for a 3 PM rosary, a priest may occasionally come to lead mass but generally this is a church for a small community and those visitors are always welcomed to fill bottles with this blessed water.